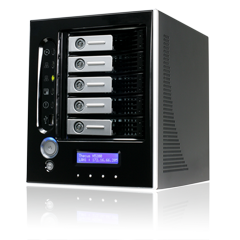 No stranger to innovation, Thecus Technology continues to redefine network storage. Thecus brought NAS storage to the home with the two-bay N2100, and powerful, flexible NAS storage to SMB's with the N5200. 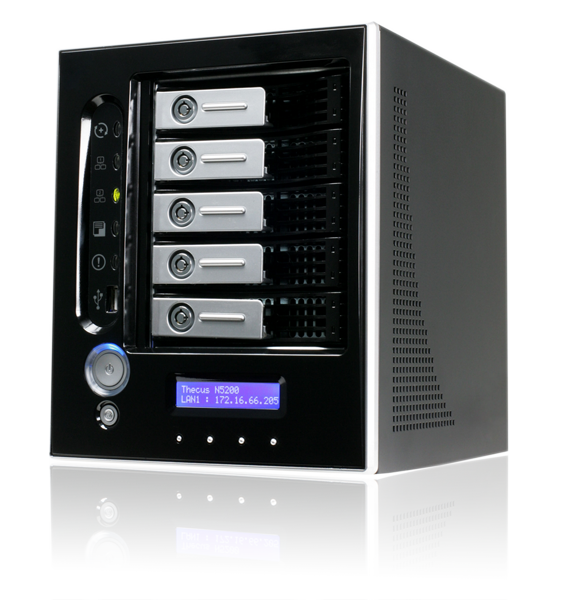 Today, Thecus is pleased to introduce its latest NAS device – theN5200PRO. With unparalleled performance and a bevy of useful features, the N5200PRO brings together Thecus' latest and greatest storage technologies for a NAS device unlike any other. Designed for hardware enthusiasts and SMBs, the N5200PRO packs some serious power under the hood. Driving the N5200PRO is a Low Voltage Intel® Celeron® M Processor and 512MB of DDR memory, making the N5200PRO the fastest 5-bay NAS on the market. With five 3.5” SATA drive bays, the N5200PRO features up to 5TB of storage capacity, and support for multiple RAID levels allows multiple RAID volumes on a single system for optimal flexibility. To access data faster than ever before, the N5200PRO supports iSCSI initiators, enabling users to access the N5200PRO as an iSCSI target device over the Internet or LAN. With these features, users will experience high system performance, flexibility, and data reliability. *PDC/AD support: Works as a client member in an Microsoft NT 4.0 domain/Active Directory domain, allowing the N5200PRO to utilize the domain users and groups setting for authentication to the system and authorization to the share folders.